Hummingbird Trumpet is a member of the Evening Primrose Family. The plant grows to 2 feet in height and has dark green, elliptical, hairy leaves with toothed edges that grow to 1 inches in length all along the plant's stem. 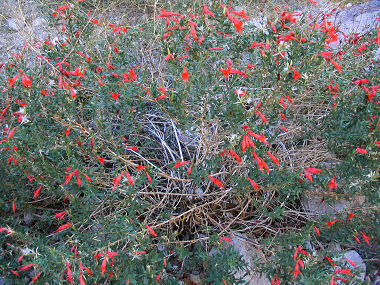 The plant typically grows in moist areas along washes and streams at elevations between 2500 - 7000 feet. 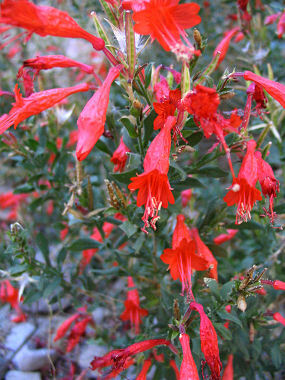 Hummingbird Trumpet is also known as Arizona Trumpet or California Fuchsia. Hummingbird Trumpet blooms between June - December and produces a red, trumpet-shaped flower with 4 upper lobes and long stamens to 1.5 inches in length.